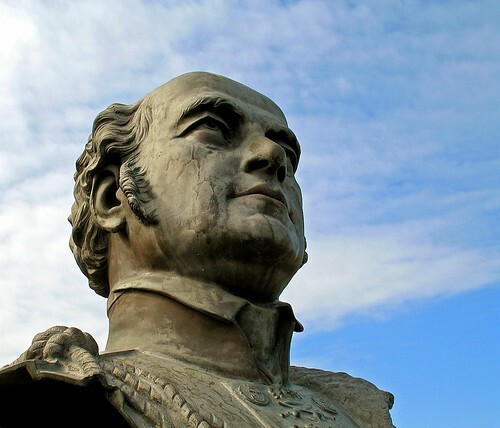 On November 15, 1866, a statue of the explorer Sir John Franklin was unveiled in Waterloo Place before a large crowd of well-wishers. When they heard that “to all future times the name of Franklin would be treasured among the greatest and bravest of those naval heroes of whose glory and memories England was so justly proud”, there was enthusiastic applause. For many of those present, a statue would have seemed like a natural choice to commemorate someone who had died in the Arctic. It was popularly assumed that being frozen to death was a gentle way to go, swaddled by snow and glazed over by ice, and that it left the corpse majestically unchanged by time, to become one of the “statues sculptured in the icy rock” Dickens refers to in his 1857 prologue to The Frozen Deep. For Franklin’s grieving widow, however, the ceremony represented a monumental full stop. After two decades of campaigning, first to rescue her husband, after his ships Terror and Erebus disappeared in 1845 while attempting to discover a navigable route over the top of North America, and then to rescue his reputation once it became clear that he was dead, here at last was tangible proof of Franklin’s heroic stature. In life a podgy, balding man of middling height, in death he was transformed into a firm-jawed figure eight feet tall, perched on top of an imposing granite plinth, and surrounded by railings to protect him from the sticky fingers of “mischievous boys and others”. The statue put Franklin at the heart of those restless, rummaging Victorian attempts to subdue the wild edges of the world to some kind of order. On the base of the plinth, his men are depicted in a relief panel standing in pious, disciplined rows as he is buried, and a motto asserts their claim to have discovered the final piece in the navigational jigsaw puzzle of the Northwest Passage: “They Forged the Last Link with their Lives”. That was at best wishful thinking, but their status as national heroes relied less on what they had achieved than on what they had come to represent. In discovering man’s physical limits, they had also demonstrated that no environment was hostile enough to destroy the toughest fibres of his moral being, such as courage, duty and loving fellowship. In sacrificing themselves for the greater good, they had discovered a greater idea of goodness. The problem with this heart-warming version of Franklin’s last expedition is that it bears little relation to what really happened. “From concept to motto”, argues Andrew Lambert in his revisionist biography, “the monument was a lie”. The truth was far nastier. According to a scribbled note left in a cairn on the remote northwest corner of King William Island, Franklin had died on June 11, 1847, after his ships had been frozen in the pack ice for nine months. On April 22, 1848, with no prospect of a thaw, the surviving officers decided to abandon their icy wooden coffins and lead more than a hundred men on a march towards the distant Great Fish River. Weakened by hunger and scurvy, they may have known that there was no realistic prospect of reaching it. Even dragging sledges weighing up to 1,400 pounds, they could only carry enough supplies for around forty days, less than half of what they needed to survive. It was a death march. As they inched their way across a bleached landscape of thrusting cliffs and greedy crevasses, Franklin’s men dropped dozens of small memorials: watches, cutlery, books, still-loaded guns. For Captain Francis McClintock, one of the many would-be rescuers encouraged by the indefatigable Lady Franklin, they were at once clues and relics. However, as he quickly discovered, any attempt to retrieve some kind of meaning from this scattered trail was complicated by the other objects that studded the landscape: the men’s corpses. Some had simply been abandoned, like the skeleton still dressed in a neckerchief neatly tied in a “loose bow-knot”, who had “fallen on his face in the position in which we found him”. Others had not been entirely left behind. Near two skeletons found in a boat was a scattering of human bones that had been cut with steel knives. Despite some nervous attempts to blame the local Inuit population, not least by Dickens in a shrilly racist article published in Household Words, the evidence was clear: whether through choice or necessity, the survivors had turned to cannibalism. “These men were hungry”, Lambert writes with some relish, “and they did not waste anything.” The fingers were defleshed, the larger bones were cracked open to get at the marrow, and the skulls of the skeletons in the boat were missing, indicating that they had been carried off so that the nutritious brains could be consumed later, a grotesque form of takeaway. Lambert estimates that forty or fifty sailors were eaten by their comrades. As he points out, “We do not know if they killed the living, picking out the weak, the young and the expendable, or whether they confined their attentions to the dead”. Either way, such scenes are far removed from those shown on the base of Franklin’s statue. 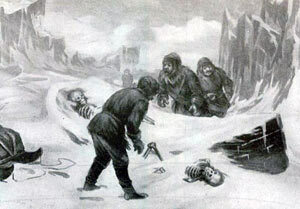 If anything they are closer to another artwork inspired by the expedition, Edwin Landseer’s painting “Man Proposes, God Disposes”, which depicts the fragments of civilization surrounding an icy wreck (a tattered uniform here, a battered telescope there) and a polar bear crunching contentedly on a human ribcage. The only difference between this scene and the real events is that the savage side of nature turned out to be inside Franklin’s men all along. Their voyage into the sunless Arctic winter had become a real-life version of Heart of Darkness. Franklin’s expedition was also one of the final chapters in a much longer story of the struggle to subdue that bleak corner of the world, not only by mapping it accurately – conquest through cartography – but also by filling it with meaning. For centuries the Arctic had been a blank sheet of paper on which different themes could be written. Its emptiness made it a good laboratory for testing imported cultural ideas of purity and the sublime, but it was most hospitable to stories that blurred where fact ended and fantasy began. The published accounts of explorers were especially susceptible to romance, even when they had spent months doing nothing more exciting than recording scientific data and eating dried biscuits. Perhaps appropriately for an environment where the boundary between ice and water was always shifting, even the most stolid of these accounts frequently came close to dissolving into myth. The most persistent myth of all was the existence of the Northwest Passage, a trade route that it was hoped would act as a short cut between the North Atlantic and the North Pacific, and lead to fame and fortune for whoever discovered it. In the end it turned out that there were several ways through an unpredictable maze of channels, although they were only navigable for a few weeks of the year, and so not commercially viable before the arrival of ice-breakers, which allowed sailors to smash their way through obstacles rather than carefully navigate around them. Until then the Northwest Passage was an invitation to dream and scheme, although the practical difficulties did not prevent earlier explorers from fighting their way north in wooden sailing vessels which, when they became trapped, proved to be as vulnerable as a walnut shell in a vice. Nor did it prevent them from peddling their own brand of wishful thinking, such as the theory that the further north one travelled, the warmer the sea became. Some of these cultural responses were as artificial as Arctic Roll: the Franklin Gallery, for example, a central part of the Royal Naval Exhibition at Chelsea Hospital in 1891, featured a house-sized “iceberg” complete with fake polar bears and twinkling electric lights designed to replicate the aurora borealis. But even as cartographers continued to chip away at the map’s remaining blank spaces, few people were prepared to acknowledge that the real unknown lay closer to home. Franklin’s men did not have to eat each other to discover how whisper-thin the veneer of civilization was. (Darwin might have appreciated the name of the tug chosen to tow their transport ship out to sea: HMS Monkey.) Even expeditions that started off with the intention of bringing culture to this chilly wilderness – amateur dramatics for the officers, education for the ranks, and compulsory religious services for all – found themselves limping home, disfigured by frostbite and haunted by the screams of men driven mad by darkness and solitude. The search for the Northwest Passage concentrated such disappointments, because as Glyn Williams points out in his superb history of the quest for this aquatic prize, “No episode in the history of oceanic enterprise offers a greater contrast between anticipation and disillusionment”. One explorer after another had his hopes raised and then dashed. During the 1570s, Martin Frobisher brought back 1,250 tons of rocks containing material that “altogether sparkled, and glister in the Sunne like Gold”. The result of this “madcap treasure hunt” was a series of expensive furnaces built at Dartford, and a large pile of iron pyrites, or “fool’s gold”, which was eventually used to build walls and repair roads. It can still be seen glinting mockingly in the Kent sun. Worse yet was to come. In 1716, James Knight examined some Chipewyan Indians, and convinced himself that they knew of a river on whose banks lay “Great Quantitys of pure Virgin Copper lumps of it so bigg that three or 4 Men cant lift it”. Instead, he and his crew ended up in a place the Inuit renamed “Dead Man’s Island”. This was far from being the only disaster commemorated on the Arctic map. Terror Bay, Starvation Cove, Bloody Fall, Repulse Bay: rarely can such messy human stories have been squeezed into such a neat set of labels. Nor was the construction of this map at all straightforward. The title of Williams’s book compares the search for the Passage to being stuck in a labyrinth, but labyrinths have solid walls; the key problem with Arctic seas, as Williams notes, was that the ice unpredictably hardened or melted to slush. Within days a stretch of open water could become a dead end; a natural harbour could transform itself from a refuge into a trap. Franklin might seem an unlikely person to have sought these dangers out. His first attempt at an overland Arctic expedition in 1819–22 had become a byword for horror, after he and his men were forced to eat rock lichen and their own shoe leather in order to survive; having written a bestselling account of his journey, he became known as “The man who ate his boots”. There were accusations of cannibalism then, too, although in this case the offender was shot. In fact, the spectre of cannibalism seems to have trailed Franklin like a shadow: in 1836 he became lieutenant-governor of Van Diemen’s Land in Australia, where in 1822 a party of convicts had escaped into the bush and ended up eating each other. (Two years later one of the convicts escaped again and ate his companion; this time he was hanged.) Clearly Franklin was made of strong stuff, but he was also sensitive, modest and religious – qualities that were not always shared by those around him. During one factory visit the female convicts showed how boring they found being preached at by turning their backs, lifting their skirts, and smacking their bare bottoms at the official party. Lambert’s biography is good on these details of Franklin’s career, and generous in showing how they contributed to his public image before he took up his final, fatal command. In some ways he is too generous. To describe Franklin as a “Tragic Hero” suggests that he was something more than a man who found himself in the wrong place at the wrong time, but the book does not give strong grounds for thinking of him as a hero in the familiar tragic mould. “Franklin’s culture, science and humanity transformed the colony . . . . Franklin’s enlightened, benevolent and charismatic government . . . . Franklin’s businesslike work habits, insight and powers of expression”: all these examples come on the same page, but they speak of a good civil servant rather than a figure of tragic grandeur. Of course, overstatement is a natural rhetorical mode for biography, particularly when the author is attempting to clean off the dust that has accumulated on his subject over the years, but too often here it leads to prose so pumped up that arguments are distended out of proportion to the evidence. Sometimes this is just a matter of slack editing, as when the scientist Edward Sabine is described as a savant who “was quite literally forced out of office”, or we are told that the Franklin story “retains the power to deprive grown men of their wits”, and then a few pages later that it “has the power to deprive grown men of their reason”. Some ideas are repeated so often that they take on a strangely self-scrutinizing quality, as if even the author wasn’t entirely convinced: “There can be no doubt that magnetic science was the key to the expedition . . . . the key ‘exploration’ task was linked to the magnetic pole . . . . Magnetic science dominated the genesis and direction of the Franklin expedition . . . . magnetic science dominated the mission”. Lambert’s stress on the scientific work that Franklin was asked to undertake is a valuable corrective to the Boy’s Own narrative that has come to dominate the explorer’s life, but by the time we reach his conclusion, which is that the heroic myth promoted by Lady Franklin “warped the mindset of an age” and “transformed the newly enfranchised working classes into willing cannon-fodder” for the Great War, the over-writing is sadly symptomatic of a book that has lost its way. This is especially unfortunate given the book’s powerful opening, in which Lambert describes a research trip to the “cold hell” of King William Island (the word “cold” exhausts synonyms as it shivers through his account) during which he experiences the effort it takes merely to stay alive in such a desolate place. But for a sense of how other people have responded to the same environment, his book is far less successful than Glyn Williams’s wide-ranging and crisply written survey. Williams does not say if he has experienced the Arctic at first hand, but he is good at choosing passages that evoke its peculiar mixture of extravagance and dullness. The uniform whiteness, interrupted by moving human specks and the occasional splash of blood. The relentless silence, broken only by the creaking of snow and the howling of dogs. And just out of sight and hearing, the thin snap of ice as a cruise ship makes its way through a once solid sea, and the passengers gather on deck to wonder where the polar bears have gone. Robert Douglas-Fairhurst teaches at Magdalen College, Oxford. His book Victorian Afterlives: The shaping of influence in literature was published in 2002. He is co-editor (with Seamus Perry) of Tennyson Among the Poets: Bicentenary essays, 2009. This entry was posted on January 18, 2010 at 13:03 and is filed under Polar history. You can follow any responses to this entry through the RSS 2.0 feed. You can leave a response, or trackback from your own site. From the mutilated state of many of the corpses and the contents of the kettles, it is evident that our wretched countrymen had been driven to the last resource — cannibalism — as a means of prolonging existence. It is impossible to form an estimate of the character of any race of savages from their deferential behavior to the white man while he is strong. The mistake has been made again and again; and the moment the white man has appeared in the new aspect of being weaker than the savage, the savage has changed and sprung upon him. There are pious persons who, in their practice, with a strange inconsistency, claim for every child born to civilization all innate depravity, and for every child born to the woods and wilds all innate virtue. We believe every savage to be in his heart covetous, treacherous, and cruel; and we have yet to learn what knowledge the white man – lost, houseless, shipless, apparently forgotten by his race, plainly famine-stricken, weak frozen, helpless, and dying – has of the gentleness of the Esquimaux nature. –“The Lost Arctic Voyagers”, Household Words, December 2; 1854. Dr. John Rae rebutted Dickens in two articles in Household Words: “The Lost Arctic Voyagers”, Household Words, No. 248 (December 23, 1854), and “Dr. Rae’s Report to the Secretary of the Admiralty”, Household Words, No. 249 (December 30, 1854). Though he did not call them noble, Dr. Rae, who had lived among the Inuit, defended them as “dutiful” and “a bright example to the most civilized people”, comparing them favorably with the undisciplined crew of the Franklin expedition, whom he suggested were ill treated and “would have mutinied under privation”, and moreover with the lower classes in England or Scotland generally. (Dr. Rae himself was Scots). Rae’s respect for the Inuit and his refusal to scapegoat them in the Franklin affair arguably harmed his career. Lady Franklin’s campaign to glorify the dead of her husband’s expedition, aided and abetted by Dickens, resulted in his being more or less shunned by the British establishment. Although it was not Franklin but Rae who in 1848 discovered the last link in the much-sought-after Northwest Passage, Rae was never awarded a knighthood and died in obscurity in London. (In comparison fellow Scot and contemporary explorer David Livingstone was knighted and buried with full imperial honors in Westminster Abbey). However, modern historians have confirmed Rae’s discovery of the Northwest Passage and the accuracy of his report on cannibalism among Franklin’s crew. Canadian author Ken McGoogan, a specialist on Arctic exploration, states that Rae’s willingness to learn and adopt the ways of indigenous Arctic peoples made him stand out as the foremost specialist of his time in cold-climate survival and travel. Rae’s respect for Inuit customs, traditions, and skills was contrary to the prejudiced belief of many nineteenth-century Europeans that native peoples had no valuable technical knowledge or information to impart. Dickens’s racism, like that of many Englishmen, became markedly worse after the Sepoy Rebellion of 1857 in India. This event, and the virtually contemporaneous occurrence of the American Civil War (1861-64), which threatened to, and then did, put an end to slavery, coincided with a polarization of attitudes exemplified by the phenomenon of scientific racism.